Buryatia (or the Buryat Republic as it is known in Russia) forms the spiritual home of the Buryat people, the most prominent and populous ethnic minority group in Siberia (with a total population of 436,000). Straddling part of the area formerly known as Trans-Baikalia (the area which sees the Trans-Siberian Railway run along Lake Baikal’s southern shore), and lying north of the Mongolian border, the region is home to the overwhelming majority of the Buryats living in Russia, with a large minority also residing on the western side of the Lake (ethnic Russians comprise the majority in both regions). To chart the history of Buryatia and its people, it is necessary to go back to the 12th century. Ethnically related to Mongolians, sharing a similar appearance, a mutually intelligible language and many age-old traditions, the Buryats were driven north as a result of conflict with their Mongolian cousins, eventually reaching the area around the southern part of Lake Baikal in the 13th and 14th centuries. However, they soon found themselves under the control of Genghis Khan and the Golden Horde, leading to a large degree of integration between the two Mongolic tribes in Buryatia. As a result of this, all modern day Buryats have some mixed MongolBuryat blood. It was not until the 17th century that Russian Cossacks entered the area from the west, introducing Christian Orthodoxy to the region as a belief system (which many Buryats practise to this day). After a century of initial resistance and uprising by the Buryats, the Russian newcomers were eventually accepted and it was not long after this that the region and the Buryats themselves started to become Russified. Having existed up to this point as a largely nomadic people, many Buryats soon began to reject this way of life in favour of farming and military service, with such communities trading in their felt material yurts for permanent wooden ones (a large number now live in Russian-style single-storey wooden houses). The communist years presented many problems for the Buryats; many died of starvation or were killed as a result of the ‘dekulakisation’ policy, whereby small landowners and farmers were persecuted through ‘class warfare’, overseen by Stalin. The Buryats, like many ethnic minorities throughout the Soviet Union, were seen as a potential destabilising force in society, and as a result of persecution a large number would have been forced to abandon many of their traditions and beliefs in order to survive in such a harsh political climate. Most Buryats are now completely integrated into Russian society – socially, economically and linguistically. However, many Buryat traditions have survived. The summer festival ‘sur-kharban’ is still celebrated annually, consisting of events such as archery, horse racing and wrestling, and is a significant holiday for all Buryats. 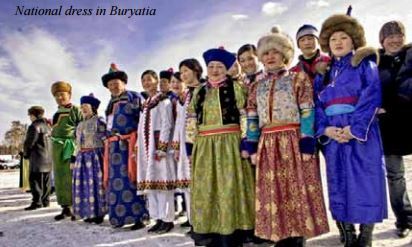 It is also a chance for Buryats to wear their fantastically colourful traditional dress, as shown in the picture above. Buryat food maintains a distinctive flavour, with the chief ingredients normally consisting of milk and meat, and this bears testament to the contined importance of keeping livestock as a main livelihood amongst Buryats. Three main religions exist within Buryatia and among Buryats. Shamanism, the pagan religion which existed before the arrival of outside forces, is still practised by some and, indeed, is viewed by many Buryats as their true faith. However, many have converted to either of the two religions introduced by invading forces, Russian Orthodoxy (as mentioned above) or Tibetan Buddhism. In fact, the region is particularly well-known for being the ‘home of Buddhism’ in Russia. Forty-five monasteries are scattered throughout Buryatia, especially in the eastern part of the region and around the Buryat capital, Ulan-Ude. The largest of these is the Ivolga Monastery. Situated 23km from Ulan-Ude, this remains the most impressive and significant Tibetan monastery in Russia and is considered an important world centre of Tibetan Buddhism. I was lucky enough to visit the village of Kiren in south-western Buryatia and, although I stayed there for only a short time, I gained an insight into life in this part of the region through the people I met there. Among those I spoke with, the views and experiences of the young people in the village gave me a particularly strong sense of what the future holds for the region. I spoke to Anya, a Buryat student from Kiren at the Irkutsk State Linguistic University (ISLU), about her experiences. Despite acknowledging that she has an adequate understanding of the indigenous Buryat language, she admitted that she rarely speaks it. “It depends on the situation, but even when speaking with my mother I find it generally easier to express myself in Russian”. Indeed, Russian is far more commonly spoken amongst Buryats in this part of the region than the Buryat tongue itself. This was emphasised further when I was invited to a party at the home of a local family, where I heard almost no Buryat spoken at all. When I proceeded to ask Anya about other young people from Kiren and the surrounding region, she made it very clear that an overwhelming number of them see their immediate futures in provincial cities such as National dress in Buryatia Looking East Issue 9 Spring 2011 page 5 Ulan-Ude or Irkutsk, where wages and opportunities for work are inevitably more plentiful. She did, however, add that she always loves returning to her home town. On returning to Irkutsk, I spoke to Sasha, another student at ISLU. Despite hailing from the eastern part of Buryatia, she also told me she only speaks a limited amount of the language, although she has a full repertoire of Buryat songs, which she told me she likes to sing from time to time. When I asked her about whether religion plays a large part in her life, she explained as follows. This, I got the impression, was the universal attitude of all the Buryats I met, and suggested a readiness to embrace and appreciate the age-old traditions along with the new. This entry was posted in Russia, Siberia and tagged Buryat, Buryatia, ethnic minority, Genghis Khan, Russia, Siberia. Bookmark the permalink.